Sawadee ka! Do you love Thai food as much as I do? Tom yam soup is a must whenever I dine at any Thai restaurant. Beside the tasty and spicy Thai dishes, the type of rice that they served is very important also. For Asian, rice is the source life - a staple, comfort food and its our main meal. Rice can influenced our appetite, enhanced pairing the dishes and our overall dining experience. Recently, we just had the perfect combo of Jasmine Sunwhite Fragrant Rice and Exquisite Thai Dishes @ Erawan Classic Thai & Fusion Restaurant. Let’s take a closer look at the Thai dishes that we had that day. The chef specially prepared 2 types of Thai Plain fried Rice for us; one using the Jasmine Sunwhite Fragrance Rice and another one using the Jasmine Super 5 White Rice. Continue to read if you want to know what is the different between the Sunwhite Rice and Super 5 Rice? The other dishes are tom yam seafood clear soup, green curry chicken, tropical fruit curry, thai basil minced chicken, spicy prawns with petai, omelette with prawns and stir fried kalian with garlic. Can’t get enough of their tom yam seafood clear soup, I can taste the natural sweetness of the seafood and also the aroma of the tom yam. It’s not too spicy, salty and not loaded with msg as I don’t feel thirsty after the meal. The thai basil minced chicken is one of my favourite too because thai basil is always good in any dishes. Be warned this dish is indeed spicy with cili padi, black pepper and herbs. The Jasmine Sunwhite Fragrant Rice is perfect for Thai Fried Rice. If you look closer at the grain of the Jasmine Sunwhite is slight bigger and rounder than the Super 5. When it’s cooked the texture is soft, fluffy and smooth with the fragrant that will arouse our appetite. Even without the dishes, the plain fried rice using Jasmine Sunwhite taste good on its own. The rice texture remains individual by itself, in another word it’s not broken. It’s firm on the outside and fluffy on the inside but not mushy or sticky or dry. Therefore you will not feel full that fast. When chewed the rice together with the dishes, the moderate starchiness of the rice with blend in with the dishes perfectly. Where else, the fried rice with Jasmine Super 5 White Rice is like the normal fried rice that we usually have. The texture is slightly harder and less fluffy compared to Jasmine Sunwhite Rice. It tastes not bad as well. Back to basics, a bowl of steamed plain Jasmine Fragrant Rice is the perfect to go with any Thai dishes especially the sour and spicy tom yam soup. So appetizing, onbe more bowl of rice please. Well, the dishes paired with right type of rice thus make a lot of differences when we eat. It gives more satisfaction and enhanced our dining experience. Overall it was a pleasant dining experience with Jasmine Rice at Erawan Classic Thai & Fusion Restaurant. I just had tom yam twice in a row in different restaurants in Ipoh. Your post has made me crave for even more. The basil minced chicken and spicy prawns with petai paired with the Jasmine sunwhite fragrant rice can complete a great meal for me. I love the texture of the rice! Those spicy prawns is my kind of dish. I would love to learn how to make that. I've tried cooking Jasmine Rice before but it was a disaster. Sawadee ka!....meaning nakamura sumptious?! Lol The fried rice with Jasmine Super 5 I crave for with spicy grilled prawns, chicken diced around it. The feeling would be awesome! I just recently discovered how delicious Thai fried rice is at a food truck place. Oh my gosh. I have been missing out! And to cook it with none other than jasmine rice is perfection. Thai food really looks and taste so good. Our family loves Thai food. Will check this out if and when we visit Malaysia in the future. your post reminds me that i haven't had Thai food in months. oh, how can I forget my most beloved dishes! I love the fragrant rice as well - eat on its own tastes fantastic! I love Thai food. Very jealous my hubby now lol. Love the way it is cooked and looks very tempting. Jasmine White rice always my favourite and my family consume it too. It bring the nice aroma of the rice and suit to eat with Thai food too. I love Thai food...Spicy and yummy! Thai rice has this very nice fragrance which is so nice. Thai food is one of my favorite cuisines! I specially love Tom Yum! I even tried cooking it at home. I bought the ingredients during one of my trips in Thailand and immediately tried doing it when I returned. I also love the sticky rice with mangoes. I love the taste of Jasmine Rice. It just goes so well with the rich and spicy taste of curry and other thai food. Everything looks so good. And the rice is my fave, I could eat that alone and be content. There are some tasty looking dishes here. All the spice and colourful add ons would make a wonderful meal! I am actually not good at distinguishing rice although, I know how to appreciate a good one. Thanks for all the info about these types of rice, it's nice to learn new things about it. i fell in love with Tom yam when a friend cooked one for us. It was delicious and I could not wait to have some more. Am now craving for one. I wonder if there is a Thai resto nearby in our place. Everything looks so yummy! For the rice though, I would prefer the fluffier Jasmine Sunwhite rice for all of those food pairings! 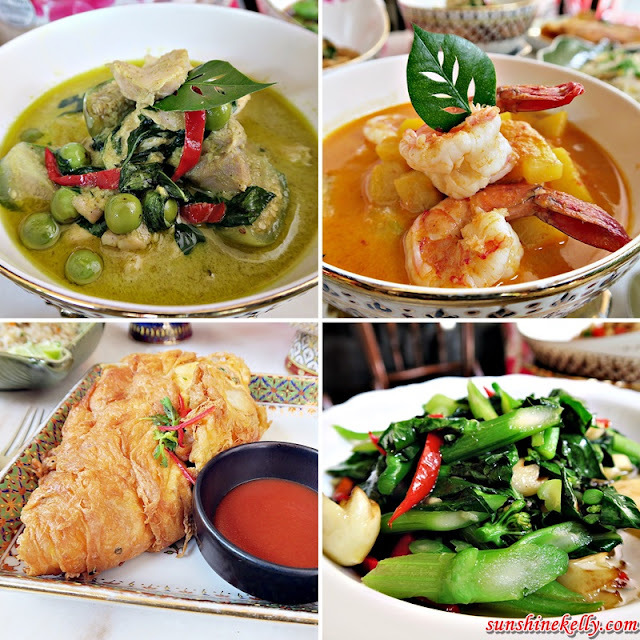 Thai food is one of my favourite cuisine as they are spicy and sour! I never used to mind the rice too much, but after trying the Jasmine fragrant rice, I realised they are really different!